This authentic meteorite pendant necklace makes the perfect jewelry for men or women. The dark shades of the meteorite contrast with the underlying rich tones of the gunmetal steel color, making its classy features ideal for wire wrapping as fine meteorite jewelry. 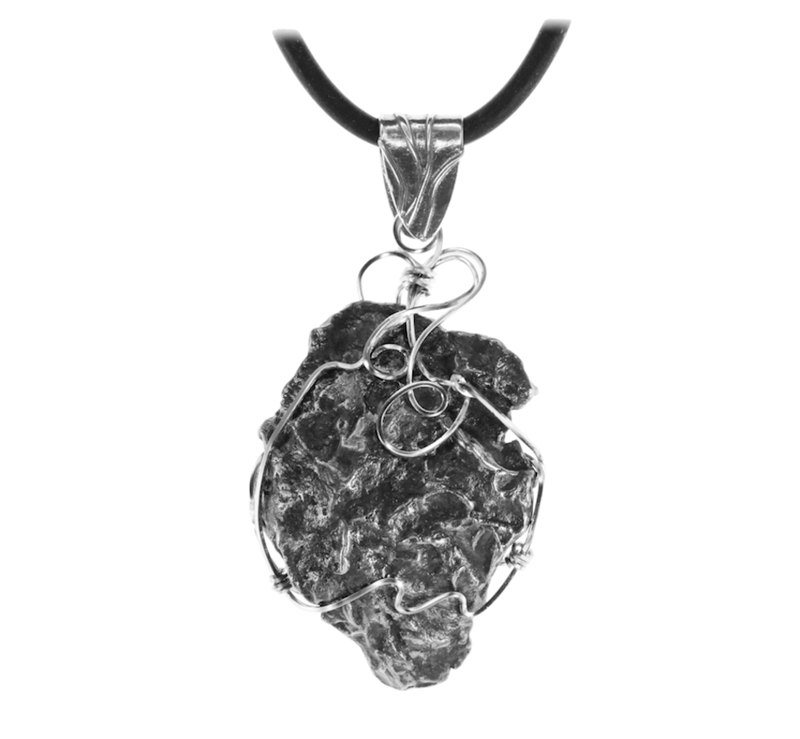 The accompanying black cord chain makes this meteorite jewelry truly stunningly beautiful and very unique. The silver patterned bail is the perfect accent. Size of the pendant: 2 1/2" L X 1 1/8" W X 3/8" D, Weight: 39 grams; Length of chain: 22"
This meteorite fell to Earth in 1947 on the Sikhote-Alin Mountains in eastern Siberia, Russia. This fall is unique in the history of meteorites because even though it was a large fall the fragments from it were discovered to be diverse in shape and appearance. Some meteorites were twisted shrapnel-like fragments with minor thumbprints. Because of these varying and interesting looking shapes the Sikhote-Alin meteorite has become one of the premier meteorites to be sought after by collectors and for meteorite jewelry, alike. Ships in a attractive jewelry box with Certificate of Authenticity and information about Sikhote-Alin meteorites and black cord chain. The chain is already 22" but can also be 20" or 24"selected at checkout. A beautiful gift from our cosmos! Great as a gift, Father's Day, Mom's birthday or special occasions or just because.